Christianity101: Satanism In The Vatican! Please notice the picture above with an upside-down cross. In his article, The Kingdom of Satan, Professor J.S. Malan says this about the inverted cross . . .
"This cross is not broken, but turned upside down. It indicates the rejection of Jesus Christ and contempt for the gospel of salvation. Inverted symbols are typical of the opposite values pursued by Satanists. People who are sometimes sacrificed to Satan on Black Sabbath are crucified upside down in accordance with this tradition." It is easy to find Satanic websites and occult stores where you can purchase all types of items with inverted crosses. 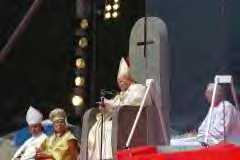 The "Upside Down Cross” symbolizes mockery and rejection of Jesus. Necklaces are worn by many Satanists. It can often be seen on Rock singers and their album covers." The "Bent Cross" is a grotesque emaciated depiction of Jesus Christ, the only Son of God who died to provide salvation for those who believe in Him. 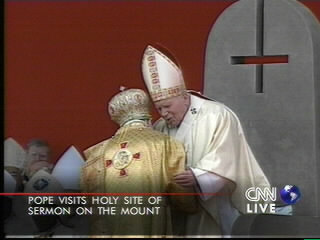 This scepter is used by the Popes on many occasions. Its occult ramifications and connections cannot be disregarded. 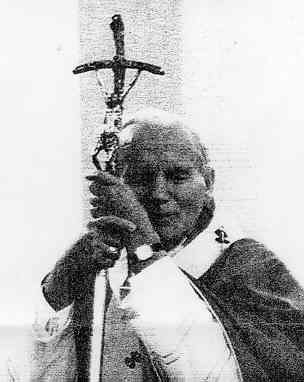 Pope John Paul II with frontal view of the Bent Cross. 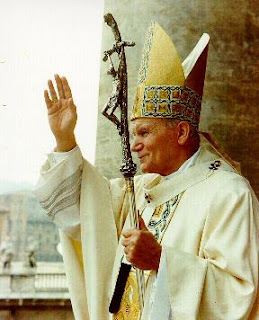 Pope John Paul II with side view of the Bent Cross. The Catholic religion often calls herself the "Mother Church." She's NOT the mother of Christ's church! By calling herself "mother" she is telling on herself. Is this the abomination spoken of in the Scriptures? . . .
Notice the Catholic religion calls herself a woman. The Bible calls Catholicism a whore, and what a GREAT WHORE she is—committing spiritual fornication with the kings and rulers of the earth (nearly every king throughout history has had some type of political, economic or religious ties with the Vatican). Read about how Nazi Germany and the Vatican worked together to murder millions of innocent Jews in the holocaust! Read The Vatican's Holocaust. She's DRUNKEN with the blood of the saints. Study the Inquisitions—the torture and killing of tens-of-millions of people. Oh, even the antichrist is naked in light of God's word. Catholicism’s ill-gotten children profess to know Christ but do service to Satan by disregarding the commandments of God in order to keep the traditions of men which papists even themselves call "TRADITION." Why is she (the whore) called a mystery? The antichrist spirit of ancient pagan Babylon, though seemingly long fallen, lives in the rites and blasphemies of the Roman Catholic religion. Now that ancient Babylonian false religion lives today within the Catholic religion, disguised by Christian names. What a Satanic scam! 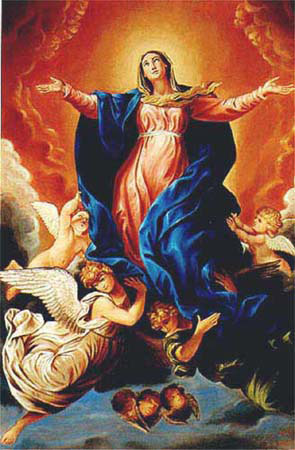 The queen of heaven is now... Mary! Mystery Babylon lives, undetected by doomed millions across the world. 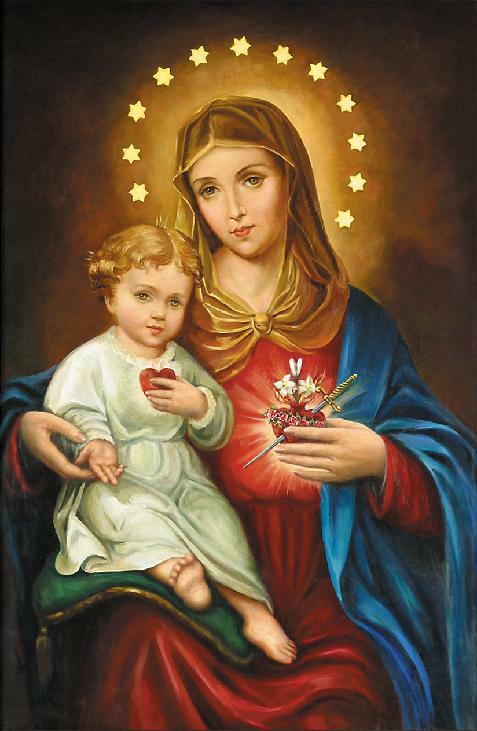 Notice the Halo around Mary (especially her head). 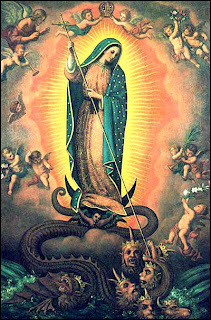 The is an idolatrous practice of the Catholics which symbolizes deity (that she is equal with God).The Babylonians practiced the same idolatrous worship to the Queen of Heaven. Mary is NOT deity, she was a normal every-day woman. Yes friend, Satan is definitely working in the Vatican and in Catholic organizations all across the world. Though most Catholics will deny worshipping Mary, the evidence says something very different! They bow down and literally pray in the name of "Mother Mary" to a graven statue of Mary. This is sinful idolatry! They are lying through their teeth. 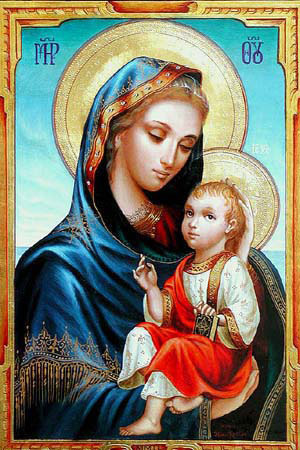 God makes CLEAR in His Word that He will NOT share His glory with another (that includes Mary). How could anyone be so foolish to actually bow down in prayer to a statue of Mary, yet at the same time deny that they are worshipping her? Talk about crazy! God clearly command us in the second of the Ten Commandments NOT to make unto ourselves ANY graven images. Ok, so then why does every Catholic BOW DOWN before a statue of Mary in their worship places? I'll tell you why... because they are practicing FALSE religion totally void of the truth of God. You can argue whether or not you are worshipping Mary as your bowing down to her; but one thing is for certain, God has commanded us in Exodus 20:5 NOT TO BOW DOWN to her. Even if your not worshipping Mary, you ARE SINNING if you bow down to her because the Bible strictly forbids it! 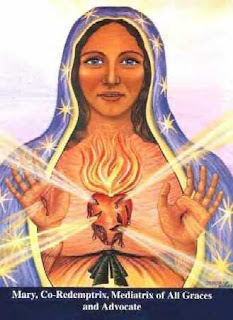 As I write, millions of people all around the world are bowing down to Mary in violation of God's Word. Yes, Satanism is in the Vatican!